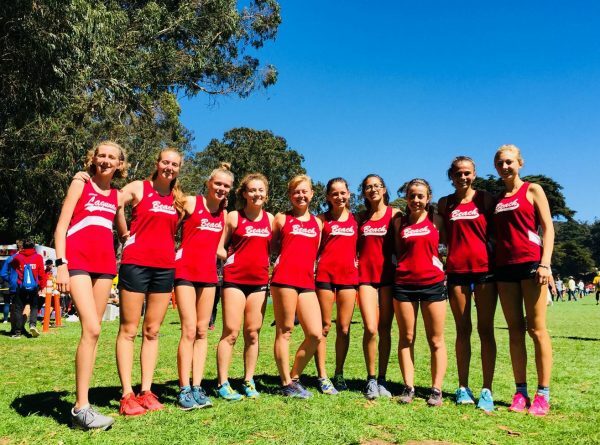 The varsity teams traveled to San Francisco last weekend to run in the 46th annual San Francisco Cross Country Meet sponsored by Lowell High School on Saturday, Sept. 8, in Golden Gate Park. The course was not a standard length at 2.93 miles (4,715 meters) and the 63 boys teams and 50 girls teams were divided into two arbitrary groups regardless of school size and ability. The boys finished fourth of 29 schools in their race with a team time average of 15:36 behind Bellarmine, Clovis North, and D4 rival Sir Francis Drake of Marin County. Overall, the Breaker time was fifth best with D2 power Granada (Livermore) the only team from the first pool to post a better time than Laguna. Scoring for the Breakers were Ryan Smithers, Sebastian Fisher, Cal Nielsen, Mateo Bianchi, and Zach Falkowski. On the girls side, Laguna won their race edging Palo Alto for the title. Overall their time was fourth best just a shade slower than D4 school, Menlo. Granada had the top time followed by St. Francis/Mt. View. Scoring for Laguna were Hannah Konkel, Ressie Rose, Sierra Read, Morgan Falkowski, and Sydney Schafgen. The teams run in the Norco Invite on Saturday, Sept. 15. Sarah Hollinshead = 43, Gigi DiMond = 44, Maya Vidas = 48, Claire Smithers = 49. Kenya Ripley Dunlap = 49, Kennedy Roller = 53This past week the Breakers faced three no-league matchups Fountain Valley on 9/11, Samueli on 9/12 and Corona del Mar on 9/13. League play begins on September 25 with Edison. Tennis opened the season on September 4 at Dana Hills losing 14-4 to the Dolphins. Sarah MacCallum won two of three singles sets 6-1, 6-1 while Ella Pachl and Ainsley Beresford each took a set win. On September 7 at home, the Breakers lost the 9-9 tie on games won as the squad missed # 1 singles player Pachl. MacCallum swept her sets and the Breaker’s doubles teams took six of nine sets. Laguna met San Juan Hills this past week. J Serra was scheduled for this past week but could not field a team. Laguna continued to play close but found a way to drop two more matches last week losing at Foothill (15-3) on Wednesday 24-26, 21-25, 21-25 and at Edison (12-9) on Thursday 17-25, 23-25, 21-25. Against the Knights, Laguna led 23-20 in the first set before fading and held the same advantage in set two at Edison before losing the set. Piper Naess was the kill leader against Foothill with 11 followed by Ella Tyus with 9. Halle Carballo led in digs with 10 and Sophia Reavis looked sharp with four kills and a solo block. Against Edison, Naess was also the kill leader with 14 hitting .379 from the outside. Tyus added 7 and Carballo had 18 digs. This past week, the non-league contests were at Corona del Mar (9-10) and home for Los Alamitos (7-3). Next week the Breakers are home on Sept. 18 with Huntington Beach and open league play on Sept. 20 with Fountain Valley. Match and year-to-date statistics are posted on Max Preps and you can follow the girls team on Instagram @lbhsvarsitygirlsvb. Breakers opened the week learning they had to forfeit the Santa Margarita match due to the school failing to file the required notice to SSCIF offices on transfers participating in CIF regulated sports. Fortunately, for the remaining fall sports, this was then done on all transfers so no other varsity team will suffer. Hopefully a process has been put into place to prevent future lapses after the season begins. At the 8th Annual Santa Barbara Invitational, Laguna opened play on Thursday, Sept. 6, at Dos Pueblos High School pool with a 15-7 win over Righetti (Santa Maria) now a D1 school in the Central Section of CIF. Colton Gregory led the squad with four goals while Marshall Eichenauer and Logan McCarroll each scored 3. Breakers led 11-3 at the half. On Friday, at the same pool they surprised the top team of San Diego defeating Cathedral Catholic 8-7. Breakers jumped out early and held off a furious fourth period comeback by the Dons that fell short. Eichenauer, Gregory and Will Clark each scored two goals. That evening the Breakers took it to host Dos Pueblos 15-9 with seven goals by Gregory along with two assists. Zach Cord added three goals, James Nolan 2. Saturday’s semifinals found Laguna falling to #3 ranked Loyola 13-5 and to #4 Mater Dei in the third place game 13-9. At the end of the season: Top 8 are in the D1 playoffs, and the remaining compete for the D2 playoffs if eligible for post season.